I love eating meat, but I love tastefully done vegetable dishes even more. This love for vegetable dishes started when I was a child. I used to dislike eating vegetables, so my mum would come up with creative ways to mask certain tastes or make the vegetables appealing to my picky tastebuds. 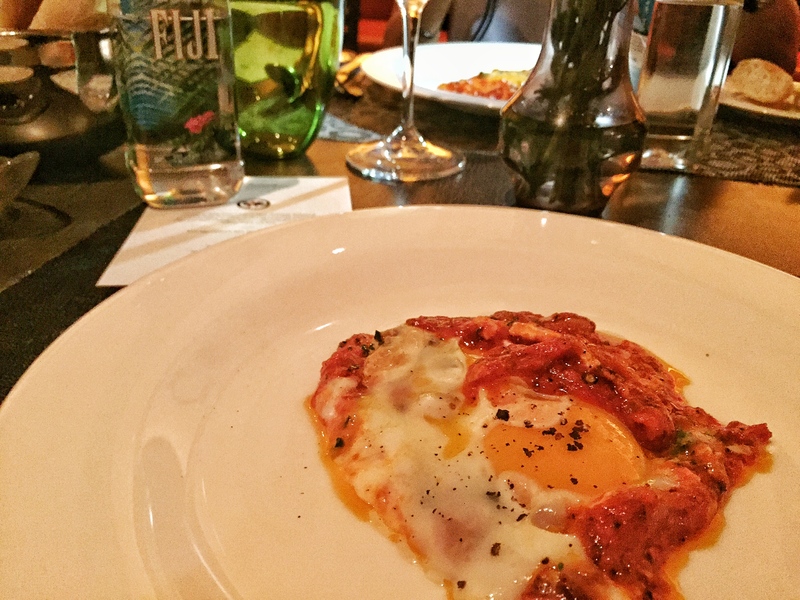 When I received an invite to taste some of the dishes that would be on this year’s very first FIJI Water Gourmet Greens Week, I was already curious. FIJI Water and Chope worked with 17 of Singapore’s best restaurants, with each of them creating and serving meat-free, vegetable focused menu for 1 week only. Personally, I wanted to see how chefs from acclaimed restaurants treated their vegetables. I was not disappointed. I kicked off my evening at Humpback with an appetiser from their Gourmet Greens Week Dinner Menu. 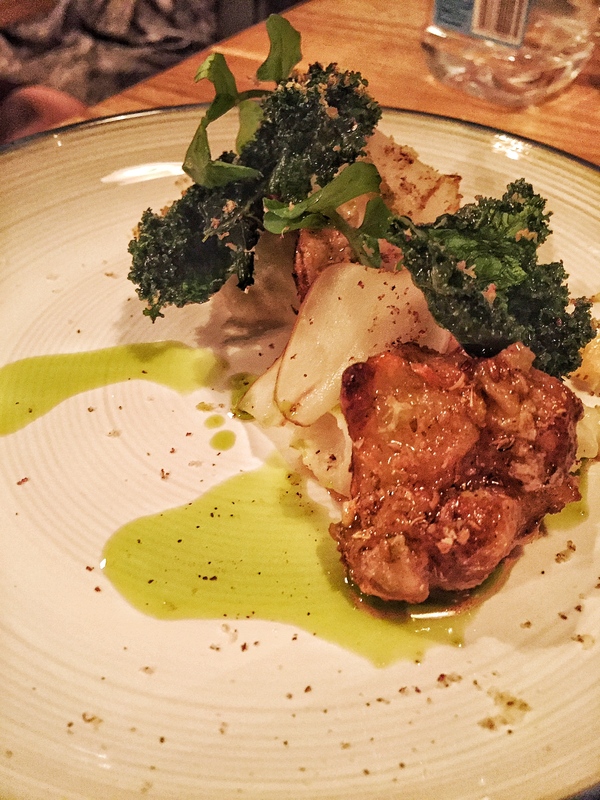 Sunchoke, puree, kale chips and honeycomb were put together for a mix of textures. I loved the sunchoke’s consistency and the slightly spicy seasoning gave my palette the kick it needed to open up. We took a walk down to Oso, where we were pleasantly hosted in a beautiful private room. 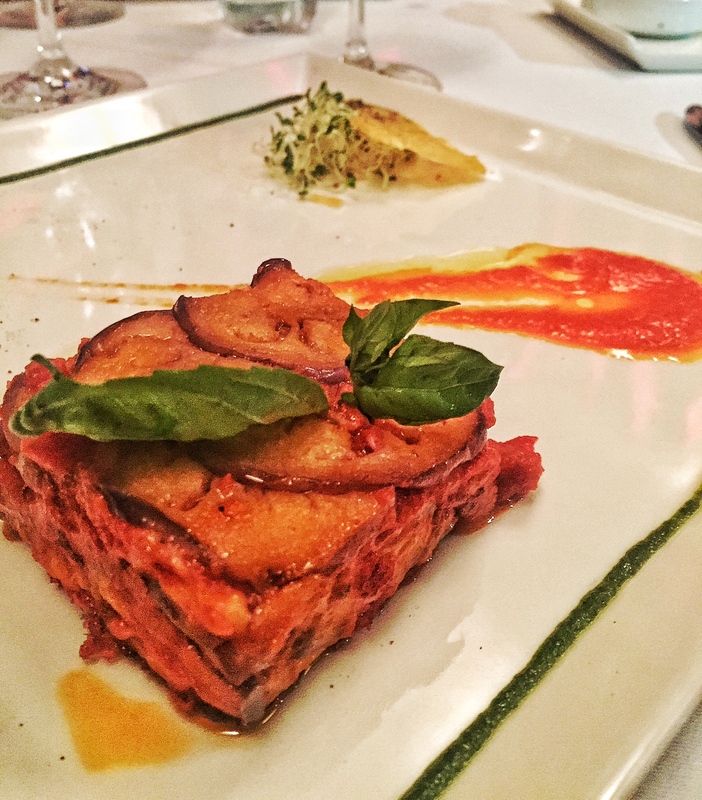 Equally beautiful was the Oven Baked Class “Parmigiana” Eggplant Tomato Sauce from Oso’s Gourmet Greens Dinner Menu. Forget about your concerns that eggplant can get mushy. Let the tomato sauce and cheese layered between slices of eggplant take the lead. It was a warm, satisfying dish which held nothing back. If you’re looking for something savoury and hearty, then the next dish will certainly appeal to you. We were dropped off at Burlamacco and got to taste the Three Eggs in Spicy Tomato Sauce & fresh herbs. In case you’re wondering, it does have the same feel and consistency as Shakshuka. The egg yolk was runny and the tomato sauce was sufficiently peppered to give it that extra kick. I know it’s supposed to be fine dining, but it’s even more scrumptious when you’re wiping it all up with bread at the table. We popped into popular steak and cocktail bar, Sugarhall, which was just a few doors down. Now, this place isn’t exactly known for its vegetables, but I must say they’ve outdone themselves. The Beetroot Tartin was (and still is) my favourite of the night. It’s starts with bed of delicately light pastry which is then layered with a mascarpone cheese, before being topped off with golden beet. The texture is exquisite. The crunch of the puff pastry meets the creamy goodness of the cheese. The beetroot was slightly warm and so comforting. We closed off with dessert at Pepernero. A sweet treat of Zabaglione Ice Cream Semitreddo with Amaretti Biscuits. I must mention that the crunchy biscuits were hand rolled, and the cream was sinful but worth every calorie. FIJI Water Gourmet Greens Week is from 23-29 th November. Participating restaurants will have 4-course lunch and dinner at a very reasonable $30++ (Lunch) and $45++ (Dinner). All diners will also get a complimentary 330ml bottle of FIJI Water during their meals. Do note that all menus are meat-free, but may contain dairy and eggs. Of course, if you want to make reservations, just visit Chope at www.chope.co. Bookings have already commenced, so hop on down and make your bookings soon! Thanks to FIJI Water, Chope and FoodNews for the wonderful evening! I’ll certainly come by after my trip to Melbourne!